24 Hour Room Service, 24 Hour Reception and Concierge Service. Complimentary Wireless Connectivity throughout and low cost telephone rates. Twice daily servicing of your room. Complimentary soft drinks personal bar and Nespresso machines with tea facilities. Same day laundry service. Multi-lingual staff. Complimentary daily newspaper. Reading room/ Library. Private dining room available for hire for meetings, events and private dinners. There is a fully equipped gym featuring the latest Technogym equipment. The hotel can also offer guests personal trainers and yoga instructors on request. The 82 guest rooms, including 9 suites, have been created incorporating the colours of the neighbourhood, with each room showcasing one of the 10 individually designed colour schemes. Every room features a rain shower and most with in-bath TV’s, a working desk, flat screen televisions, Sky HD package including sports and movies, internet radio with over 10,000 channels, CD/DVD player with access to the in-house movie library, iPod docking station, complimentary wireless internet, Nespresso coffee machines and tea making facilities, complimentary soft drinks personal bar, air-conditioning, US and EU adaptors. All room rates are subject to Vat at 20%. Breakfast is not included in room rate; Continental breakfast is at £13.25 per person or English breakfast at £19.50 per person. Food & beverage prices are subject to 12.5% service charge. Baby cot complimentary, extra bed can be accommodated from Executive room category and is at £50 per night exclusive of Vat. Reservation may be cancelled without charge up to 12 noon 1 day before arrival date. HUNter 486, brings together classic glamour and timeless hospitality reflecting local colour and introducing a new dimension to London’s drinking and eating experience. This incorporates a dining area off the open plan kitchen, the Library, the Bar and Le Salon de Champagne. The Library with Taschen bookcases is a stylish, relaxed area of the hotel to enjoy afternoon tea or a martini from the martini cabinet, expertly shaken in front of you. Le Salon de Champagne with original designer chairs, high banquette seating and a graffiti ceiling of wine tasting notes offers the guest a lavish area to match their mood. The open plan kitchen offers honest and real food, with an all day grazing menu in a friendly environment. Each space has a story; each story created and designed to inspire the guests. The function room, WHItehall 944, is an attractive and flexible space, situated on the lower ground floor. This flexible room can be dressed and lit in a variety of ways to suit a boardroom style meeting for 20, a theatre style meeting for 30, a decadent private dinner for 20 or a cocktail reception for 60 The room features all the latest equipment including:- 2 x 52” flat LCD screens, 106” drop down projector screen and, concealed projector, Video conferencing, Audio conferencing, Ambient mood lighting, Nespresso coffee machine, Nintendo Wii console, Sony PlayStation 3, CD/Blu-ray DVD Player, Sky HD Package, Access to in-house PC for use of internet / presentation etc. Complimentary WIFI and fixed point internet access All functions controlled by Crestron panel to provide user friendly and intuitive interface. Work out in the convenience of the hotels innovative gym, available exclusively to guests, 24-hours a day. Situated on the lower ground floor with a glorious vaulted ceiling, it features the latest fitness equipment by wellness experts Technogym, from treadmills and cross trainers, to rowers and weights. The gym also features an area for stetching and Power Plate equipment complete the offering. Hotel staff can also organise personal training sessions and yoga tuition on request. A jogging map of Hyde Park is available from the Concierge and is only a short 3 minute walk from the hotel. Non-smoking hotel, smoking is permitted only on private terraces in Courtyard Suites and in JUNiper 586 1-bedroom Suite. 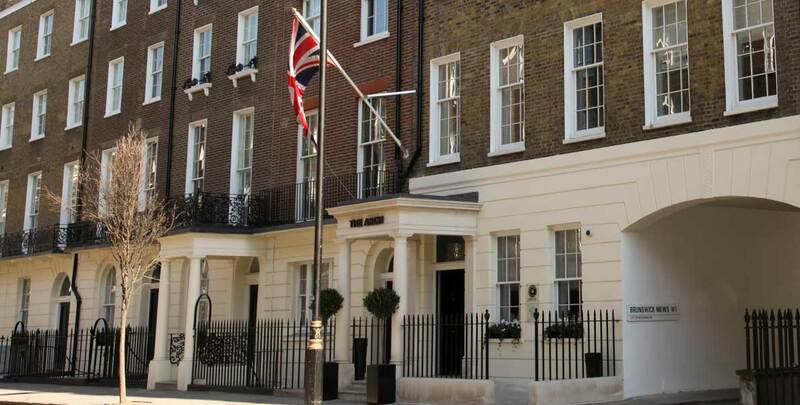 The hotel is set on a quiet residential street close to Marble Arch at the top of Park Lane and is just two blocks from Selfridges and Hyde Park. The chic boutiques and fashionable attractions of Marylebone, plus the famous shopping areas of Oxford Street and Bond Street are also within easy reach by foot. The extensive tube network also means that whether staying for business or pleasure, everything you want to experience or explore is right on your doorstep. London Heathrow is the city’s main airport and is around a 40 minute drive from the hotel. Alternatively, the Heathrow Express takes 15 minutes into Paddington Station, approximately a 5 minute transfer from the hotel. London is also served by Gatwick, London City, Luton and Stansted Airports. 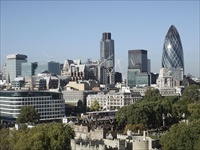 London is well served by the national rail system including the new express Eurostar service to Paris and Brussels via St Pancras International which is about 10 minutes drive from hotel. A wide variety of bars and restaurants in the area to suit all tastes and budgets.